This adorable pillowcase is made of a beautifully soft and cuddly fabric that will not fade or wear. 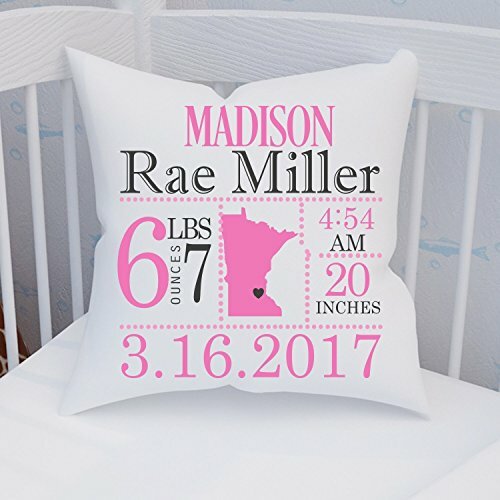 A beautiful gift for new parents and a great way to decorate the nursery. The design is dye printed on the pillow cover. It is NOT vinyl. Pillow insert is included with your purchase. Each pillow case is individually made with all the birth details. The pillow insert is removable allowing you to launder the pillowcase as needed. Please note that the heart will be placed in the approximate area of the state where it is located. It cannot be exact. The pillows is a generous 16x16". When purchasing please add birth details in the 'note to seller' box as well as state and town of birth. You will be contacted if there are any questions regarding the information on your pillow. You may request a proof for approval before your pillow is pillow is printed, HOWEVER, please be aware that it will delay shipping by MINIMUM of one day depending on how quickly you respond to proof. If you have any questions about this product by Jammin' Threads, contact us by completing and submitting the form below. If you are looking for a specif part number, please include it with your message.